Great Z's: "Good Morning. What's Up?" 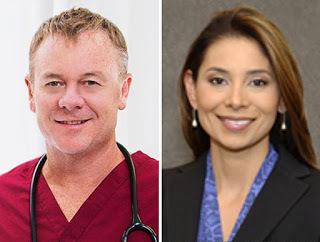 A quick update on the horrible murders of two engaged Boston anesthesiologists, Drs. Lina Bolaños and Richard Field. The lone suspect, Bampumim Teixeira, had his day in court to face charges of murder, home invasion, armed robbery, and kidnapping. As tearful family members of the victims looked on, Teixeira cheerfully and casually greeted the judge with, "Hey, good morning. What's up?" The prosecutors provided more details of the crime during the session. The suspect was apparently familiar with the building as he had worked as the building's concierge the previous year. Security cameras saw him get inside the building's garage with a backpack, which contained duct tape, a knife, two fake guns, and a mask. He made his way to the 11th floor where the doctors lived by climbing the stairs since he didn't have security access to the elevators. He then hid in a utility closet that had a peephole where he could look for victims. Dr. Bolaños arrived home first around 5:00 PM while Dr. Field came back about 6:30 PM. Shortly after, Dr. Field texted a friend that there was a gunman in the house. When the police arrived before 9:00 PM, they found both doctors dead with their throats slit. Teixeira was shot multiple times by the police when they confronted him. They found his backpack filled with jewelry and other valuables. Unfortunately for justice, he was taken to a hospital where he was given expert medical care and survived. In court, Teixeira pleaded not guilty to the crimes. The judge ordered him to jail without bail. His next appearance in court is scheduled for September 12th.